The roster of the 11th annual CKCU Ottawa Folk Festival was studded with superstars of three generations, including Michael Franti, Arlo Guthrie, Judy Collins and Jackie Washington. These talented andaccomplished performers exemplified the diversity of this year’s festival lineup. Festival goers had an opportunityto applaud artists from across Canada and the United States and to celebrate the richness of folk music, which today sits at the crossroads of numerous cultural influences. The recipient of the 2004 Helen Verger Award was Jackie Washington. Two new festival awards were presented during the weekend. On Friday evening, Joe Grass received theGalaxie Rising Stars Award from Roch Parisien, programmer and producer of the Folk Roots channel on theGalaxie network of the CBC. Lis Harvey and Dave Carmichael were awarded the One Fret Less Award on Saturday evening. This award was made possible by a Community Foundation of Ottawa endowment established by Harvey and Louise Glatt, long-time supporters of folk music and singer-songwriters. “O Canada”, delivered a well-executed rendition of our national anthem. Chopper McKinnon and Karen Flanagan McCarthy returned to host the main stage throughout the festival. Frida’s Brow, a group named after Mexican artist Frida Kahlo, consists of Chris MacLean, Alise Marlane and Jennifer Noxon. The trio charmed the audience with gorgeous harmonies and songs reflecting a range of musical influences. Gérald Laroche entertained one and all with unique storytelling, accompanying himself on a variety of harmonicas and percussive instruments. Senegalese brothers Karim and El Hadji Diouf fronted the energetic band Diouf, an ensemble that combined vocal harmonies, percussion, guitars and drums, and performed a mix of traditional and contemporary tunes. Next up was singer-songwriter Ember Swift, who with co-creator Lyndell Mongomeryon violin, bass and bowed guitar, delivered politically charged folk-jazz-funk music. Broken Social Scene, the ultra-hip dynamic collective of Toronto’s vibrant experimental music scene, closed the evening with a series ofeclectic jams. The music proved infectious for many in the first-night crowd, who jumped to their feet and danced long into the warm summer night. Friday night opened on a dramatic note with Eagle & Hawk, a group that combined hard-driving rock with traditional Aboriginal vocals and rhythms. The audience soon warmed up to the Juno Award-winning group, which incorporated Native dance and costumes in its performance. American singer-songwriter Rachael Davis contributed an eclectic set that illustrated influences ranging from jazz to folk to pop. She was followed by Winnipeg native Joel Kroeker, whose set featured alternative folk, rock and jazz. The excitement was palpable when fiddler Eileen Ivers & Immigrant Soul opened with a dynamic set of traditional Irish music interlaced with African, Latin and American roots rhythms. Eileen Ivers amply demonstrated the talent that stood her in good stead when she starred in Riverdance. It was almost impossible not to dance! The high energy and dancing continued with Michael Franti & Spearhead. The phenomenally popular group dazzled the crowd with hip-hop roots fusion music championing peace and social justice. After putting in an intense and highly danceable performance that particularly appealed to the young members of the audience, the charismatic Franti was not ready to go home. He generously signed autographs for nearly an hour after his performance and offered kind words and hugs to his many fans. The entertainment on the CUPE Main Stage opened at 11:00 a.m. with the well-attended Canadian Spaces Live session hosted by Chopper McKinnon. This popular session featured two singer-songwriters of East Coast extraction: Joe Grass and Gordie Sampson, humorist Nancy White, and newcomer Liam Titcomb. Another live CKCU-FM show followed with the Back 40 Live session hosted by Ron Moores. 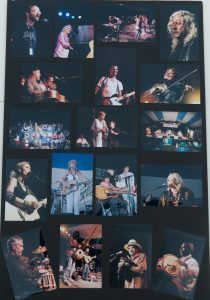 It featured Corb Lund, Rachael Davis, Rae Spoon and Michael Jerome Browne. The excitement mounted for fans of both veteran singer Judy Collins and Canadian icon Leonard Cohen with the Collins Sings Cohen session. Collins performed selections from her just-released album Judy Collins Sings Leonard Cohen: Democracy. The performance was enriched by her many anecdotes about their long friendship. Collins related how she met Cohen in the mid-sixties when he was a fledgling songwriter. She helped to launch his career by recording his songs, most notably “Suzanne”, which was a major hit. The afternoon continued withNAC Alberta Scene Preview hosted by Heather Moore and featuring Corb Lund, Lindsay Jane, Rae Spoonand The McDades. The entertainment wound down as it had begun, with a CKCU-FM host. Laurie-Ann Copple hosted the Musical Connections session featuring Eve Goldberg, Wendell Ferguson and Sandy Scofield. Taking Turns was the first session on the Bowie Electrical Stage and showcased the music of Dave Carmichael and Mark Reeves. Changing the World with a Song featured the Ottawa-based choir Just Voices led by Greg Furlong. Lonesome Paul was featured in the Welcome Back! session. Three successiveTaking Turns sessions allowed the crowd to sample the talents of Art Turner, Shane Simpson & Paul Bourdeau; The Vanity Press and Ana Miura; and Joe Grass and Kate Weekes. At the Kershman-Wasserlauf Stage, a lively Dance session showcased the music of Eagle & Hawk. The ever- popular Connie Kaldor was featured in the first Ottawa Citizen Family Concert and performed songs fromher hit children’s album, A Duck in New York City. CKCU-FM alumnus Roch Parisien hosted Galaxie Rising Stars, sponsored by the CBC digital music network Galaxie. Featured artists were Joe Grass, The Vanity Press, Ana Miura and Ryan Schneider. Sonny Ochs, the sister of the late American folksinger Phil Ochs, hosted the American Women session with Zoë Lewis, Lis Harvey and Natalia Zukerman. Another Dancesession featuring Corb Lund and his band ended the afternoon performances. The fun on the CKCU-FM Family Stage began with Music Together led by Liz Benjamin. Ottawa songwriter Russell Levia appeared next, followed by the Stories for Everyone session hosted by master storyteller Gérald Laroche. Barb Smith and Chris Moore hosted the participative Kindermusik session. The Celtic-influenced band The Gruff appeared to the delight of the assembled children of all ages. The breezily named session World Winds hosted by Ron Korb featured Bruce Fontaine of Eagle & Hawk along withDuncan Cameron and Joe Phillips of the Pierre Schryer Band. On the Ottawa Folklore Centre Stage, Arthur McGregor hosted Rise Up Singing, a session titled after the songbook of the same name. The Terry Penner Memorial Choir, directed by Michael MacDonald, had its first rehearsal. Instructional workshops included All About Flutes with Ron Korb, and Learn How to Play the Tin Whistle with Anj Daub and Jeremiah McDade. Other “how-to” sessions included How to Write a Songhosted by Connie Kaldor with Gordie Sampson, Shelley Posen and Mike McCormick, and How to Play Music Together with The McDades. The day ended with a half-hour session of a spiritual nature: Getting Started with Taoist Tai Chi. First on the Nutshell Music Stage was Joel Kroeker, who hosted the Self Expression session including Ryan Schneider and Art Turner. The lively Pierre Schryer Band performed next. Down East Pudding was hosted by Cam Wells and featured Dave Carmichael, Gordie Sampson and Nancy White. Morna Ballantynehosted Songs of Struggle and Hope, which showcased the considerable talents of Eve Goldberg, Vince Fontaine of Eagle & Hawk, Ember Swift and Just Voices. The jovial Laugh It Up session featured hostNancy White, Connie Kaldor, Washboard Hank, and Jay Bodner and Spatch Mulhull of Eagle & Hawk. The wonderful East Indian-influenced music of Galitcha was the first offering on the eclectic Rogers Stage.Dean Verger, owner of Rasputin’s Folk Café, hosted Rasputin’s Presents with Frida’s Brow, The Vanity Press and Ember Swift. The Black Sheep Live session featured musicians who had appeared at the Wakefield, Quebec folk club and included Rae Spoon, Rachael Davis, Joel Kroeker and Lindsay Jane. The Pierre Schryer Band and The Old Sod Band performed in the Celtic Crossroads session. Festival Director Gene Swimmer hosted the Director’s Choice session with Joel Kroeker, Mark Reeves and Zoë Lewis. 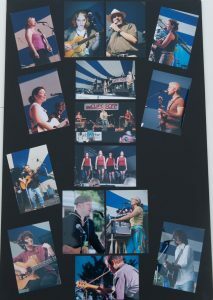 Canada’s folk, roots and world music magazine, Penguin Eggs, sponsored the Penguin Eggs Stage. The entertainment began with From Far and Wide, featuring host Sandy Scofield, The Gruff and Kate Weekes. The Silly Songs session featured funsters Mike McCormick, Eve Goldberg and Wendell Ferguson. The mood turned more serious with the session titled The Art of Justice with host Chris MacLean, Oni the Haitian Sensation, Sandy Scofield and Alise Marlane. Long-time festival emcee Karen Flanagan McCarthy hosted the Across Cultures session with Gérald Laroche and Ron Korb. The day ended with the Guitars R Ussession showcasing the talents of host Shane Simpson, Paul Bourdeau, Kristin Sweetland and Ray Hickey Jr. of the Ron Korb Band. The CUPE EnviroTent, sponsored by the Canadian Union of Public Employees, featured ongoing displays, discussions and hands-on activities related to environmental issues and responsible living. Sessions includedOrganic Food and You with Laura Telford of Canadian Organic Growers; Vermicomposting with Lori Watt of The Worm Factory; An Environmental Festival with Kathryn Briggs (EcoRail Tour); The Fair Trade Movement with Chantal Havard of TransFair; and Alternative Energy Sources with author Bill Kemp. The Saturday evening entertainment on the CUPE Main Stage opened with Vancouver-based singer-songwriterSandy Scofield, whose compelling material reflected her Métis roots. The McDades delivered a set of rootsy music that blended Celtic, world and jazz influences. The band includes fiddler, singer and producer Shannon Johnson and her brothers Jeremiah and Solon McDade. Albertan roots-country cowboys, the Corb Lund Band, performed a lively set that set toes a tappin’ in the audience. Arlo Guthrie and Judy Collins were contemporaries on the American folk scene in the sixties and onward. The capacity crowd at Britannia Park was thrilled to witness back-to-back performances from these legendary silver- haired performers. Arlo Guthrie is an old friend of the Ottawa Folk Festival. His performances in two benefit concerts in 1996 made it possible for the festival to survive a difficult period. Arlo charmed the audience withamusing anecdotes and performed hits such as “City of New Orleans” and “Coming Into Los Angeles” as well assome Woody Guthrie songs. Judy Collins’ performance was nothing less than extraordinary. Her pure, beautiful voice proved as lovely as ever as she performed a variety of material from her long career. Collins also touched on her connection with Canadians Joni Mitchell and Leonard Cohen. The evening ended with Dominican Republic artist Joaquin Diaz, who performed contemporary and traditional merengue tunes filled with syncopated accordion rhythms. 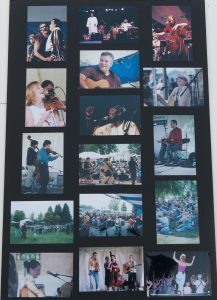 Other Saturday evening venues included the Alt-Folk Café, located onsite at the Kershman-Wasserlauf Stage, and off-site at the Travelodge Hotel Ottawa West located on Carling Avenue. The Alt-Folk Café was hosted by Ember Swift and included sets with Spiral Beach, Joe Grass, Liam Titcomb, Lindsay Jane, Kate Weekesand Rae Spoon. After Hours at the Travelodge featured Pierre Schryer; Scarlett, Washington and Whiteley; Natalia Zukerman; and Zoë Lewis and Mark Reeves and Friends in the Beachcomber Room.Galitcha hosted a jam session in the Acoustic Room. On the CUPE Main Stage, the morning opened with the New Voices session with host Sam Baijal, Natalia Zukerman, Rachael Davis, Mark Reeves and Darryn Grandbois. The soulful session Blues Without Borders was hosted by eclectic guitarist Harry Manx, and featured Jackie Washington, Ken Whiteley, Michael Jerome Browne, Solon McDade, Gérald Laroche and Joe Grass. CBC Bandwidth Live was a live version of the CBC Radio show focusing on Ontario performers, and was hosted by Bill Stunt. The diverse lineup included Oni the Haitian Sensation, Jane Bunnett, Eve Goldberg and Kristin Sweetland. DJ Mike Regenstreif hosted the Folk Roots/Folk Branches session with Jane Bunnet, Harry Manx, Rachael Davisand Jay Bodner of Eagle & Hawk. The Fiddle Focus session with host Pierre Schreyer featured Valérie Pichon and André Varin of Châkidor, Samantha Robichaud, and Shannon Johnson of The McDades. The entertainment on the Bowie Electrical Stage opened with three Taking Turns sessions. First up were The Gruff and Ball and Chain followed by Kristin Sweetland and Lis Harvey, and Lindsay Jane and Ryan Schneider. Other sessions showcased the talents of Rae Spoon, Michael Jerome Browne and The Twin Rivers String Band, The Gruff and Junkyard Symphony. A Tribute to the Past was the first session on the Kershman-Wasserlauf Stage. Host Eve Goldbergperformed and introduced Mose Scarlett, Michael Jerome Browne, and folklorist-musician Shelley Posen. 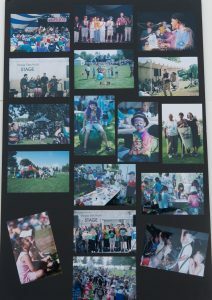 The second Ottawa Citizen Family Concert called Music in Everything highlighted the music of host Zoë Lewisand a presentation of Junkyard Symphony’s Garbage and Guitars. Audience participation was highly encouraged at three Dance sessions led by Sandy Scofield, Joaquin Diaz and Ball and Chain. The CKCU-FM Family Stage performances began with the Music Together session led by Liz Benjamin.Hoops and Flutes was a session with Bruce Fontaine of Eagle & Hawk. Kate Weekes performed in theSongs I Like session. Splash’N Boots performed two interactive sets. The Kindermusik session was led byBarb Smith and Chris Moore. The Celtic Rathskallions with Wendy Moore-McGregor performed an enjoyable and lively set. Kids of all ages were invited to participate in the Sunshine Parade, which involved marching and dancing with musical instruments. The happy and noisy celebration made its way to the main stage, gaining participants en route. The Ottawa Folklore Centre Stage opened and closed the day with rehearsals of the Terry Penner Memorial Choir directed by Michael MacDonald. How to Sing in Harmony featured the talented musicians of Frida’sBrow along with Ball and Chain. Miles Howe and Roxanne Layton hosted sessions teaching participants how to play the harmonica and recorder respectively. Rev. Ernie Cox led the session titled About Gospel Music. More harmonica tips were provided in the session Advanced Harmonica Techniques hosted by Gérald Laroche. Sources of Inspiration was the first session of the day on the Nutshell Music Stage. It featured host Kristin Sweetland, Wendell Ferguson and Lis Harvey. The Taking Turns session included sets by Darryn Grandbois, and Valérie Pichon and André Varin of Châkidor. The Gruff and The McDades teamed up in the session Western Celtic. Galitcha led the spirited Learn East Indian Dancing session. The day ended on a spiritual note with the Gospel Unlimited session showcasing host Ken Whiteley, Connie Kaldor, Eve Goldberg, Rev. Ernie Cox and Mark Reeves. On the Rogers Stage, festival emcee Karen Flanagan McCarthy hosted The Flower Hour with celebrity gardener Ed Lawrence and humorist Nancy White. The laughter continued with Funny Folk with host Morna Ballantyne, Arlo Guthrie, Nancy White and Mike McCormick. A Tribute to Leonard Cohen was hosted byNancy White and featured Gordie Sampson, Connie Kaldor, Spiral Beach, Jay Bodner of Eagle & Hawk, and Liam Titcomb singing their favourite Cohen songs. An Extraordinary Life (A Musical Conversation with Jackie Washington) featured veteran performer Jackie Washington and was hosted by his good friendKen Whiteley. The day’s entertainment closed with the Window of Opportunity session with host Laurie- Ann Copple, Natalia Zukerman, Lindsay Jane and Darryn Grandbois. Rise and Shine was the appropriately titled first session on the Penguin Eggs Stage and showcased the talents of Galitcha and Friends. Now That’s a Stretch – Yoga and Music was a participatory session pairing gentle yoga movements and music featuring yoga teacher Jo-Ann Osterman and musician Ron Korb. Shelley Posen, who leads a shape note singing group in Ottawa, hosted the participatory session Shape Note Singing for Everyone. The Doc’s Pick session was named for the popular segment on the CKCU-FM radio show Canadian Spaces. The mysterious Doc (Peter Conway of McCrank’s Cycles, a local business that is a long time sponsor of Canadian Spaces) was on hand, as were musical guests Jennifer Noxon, Gordie Sampson and Wendell Ferguson. To wind down the day, the Taking Turns session showcased Zoë Lewis and Shelley Posen. The CUPE EnviroTent featured more displays, discussions and hands-on activities related to environmental issues and responsible living. Sessions included Sun Power with Sean Twomey of Arbour Environmental Shoppe, Getting Involved with Mike Kaulbars of the Peace and Environment Resource Centre, An Environmental Festival with Arthur Goldsmith of EcoRail Tour, Fair Trade in Action with Nicole McGrath of Peri Dar, and Pesticide Safety with Mari Wellman of Coalition for a Healthy Ottawa. The Sunday evening entertainment on the CUPE Main Stage began with the Terry Penner Memorial Choirled by director Michael MacDonald. The choir consisted of festival goers who attended three rehearsals during the weekend and performed for an appreciative audience. An exceptionally high-calibre evening exemplified thefestival’s diverse lineup. The five-piece Quebec band Châkidor regaled the audience with a high-energy set that included Irish, bluegrass, Celtic and classical influences. Connie Kaldor has appeared at several festivals and as usual she wowed the crowd with a cross-section of her vast repertoire. Musical treasures Scarlett, Washington and Whiteley performed a set of their warm-hearted and sometimes amusing tunes that blended their talents in the world of folk, blues and swing. Jackie Washington was awarded the Helen Verger Award for his valuable contributions to Canadian folk music. Washington, who has an exceptional memory, recalled how he began his musical career as a child growing up in the 1930s in Hamilton,Ontario. His many accomplishments include becoming Canada’s first black disc jockey, participating in the 1960scoffee house scene, and composing more than 1,200 songs. He has toured and recorded with Scarlett,Washington and Whiteley since the 1980s. The group’s first CD, Where Old Friends Meet, received a Juno nomination in 1993. Harry Manx & The Urban Turban delivered an exhilarating performance under the stars. Manx is a master of the slide guitar and mohan veena, an instrument that combines elements of the guitar and sitar. His music meshes blues with India ragas and this unlikely combination of styles is nothing less than magical. Manx was ably accompanied by The Urban Turban: Niel Golden on tabla, Wynn Gogol on keyboards and backup singerEmily Braden. The festival ended with a powerful performance from one of Canada’s top jazz musicians, Jane Bunnett, who appeared with her band, The Spirits of Havana. Bunnett is a virtuoso on the saxophone and flute and is passionate about Cuban music, which features prominently in her repertoire. On this warm summer evening the ethereal music of Bunnett and her band provided unforgettable memories for the audience. And so ended the most culturally diverse CKCU Ottawa Folk Festival.